This event is open to everyone, not just NSA Professional members. UNLOCK Speaker Secrets to Fee-Based Gigs! Elizabeth McCormick stormed the Keynote Speaking scene by marketing herself in a precise sequence. Averaging 100 PAID speaking engagements booked every year since 2013, Elizabeth has unlocked the speaker safe of secrets to fee-based keynote bookings. Discover the 6 primary speaking essentials you NEED to get paid, including Elizabeth’s best booking tips for each category. Learn why these essentials have so much influence over the event planners and decision-makers who get you booked. Walk away with Elizabeth’s TOP SECRET “Rocket Your Referrals” program, which is a step-by-step process that will turn today’s audience into tomorrow’s sales team. What if there was a way to significantly increase the effectiveness of the proposals you are submitting? In Propel Your Proposals, highly booked keynote speaker, Elizabeth McCormick will unlock the vault of the proposal process that secures her an 80% close rate. There’s a template for that. How Elizabeth saves time and books more by creating template- and leave with the handout with suggestions on how to format hers. How to stop stressing over pricing options to offer with her surefire 2 steps. A way to Automate, Automate, Automate- no complex CRM, use GOOGLE forms and sheets (Yes- these are FREE) to cut the chaos and get the gigs! Elizabeth will reveal her TOP SECRET “Rocket Your Referrals” system- where she averages at least 5 paid engagement requests from each of the over 100 engagements she books each year (and you can too)- how to turn today’s audience into tomorrow’s sales team including her 5-step process to dramatically increase your referrals. And you’ll receive her template to help you get started. As seen on ABC News “20/20,” CBS News, MSNBC, on FOX News, on the front page of the Dallas Morning News and featured in the Wall Street Journal, Elizabeth McCormick has empowered audiences all over America with her action-packed speaking. Elizabeth supported UN peacekeeping operations in Kosovo as the S-4 Logistics Officer in Charge at the Battalion level, receiving the Meritorious Service Medal for her excellence in service. A decorated pilot and officer, Elizabeth was awarded the Army Commendation Medal twice, Army Achievement Medal two times, National Defense Service Medal, Humanitarian Service Medal, Army Service Ribbon, and the coveted Army Aviator Badge. A disabled veteran, Elizabeth was medically retired as a Chief Warrant Officer 2 after a career ending injury. She was honored with the Congressional Veteran Commendation for her commitment to duty and community. Elizabeth is a founding member of the John Maxwell Team of speakers, coaches and trainers, as well as an award-winning sales consultant teaching her nationally acclaimed sales training: “It’s Not Stalking, It’s Follow-Up”. With her empowering, energizing delivery, Elizabeth is a sought-after keynote speaker. 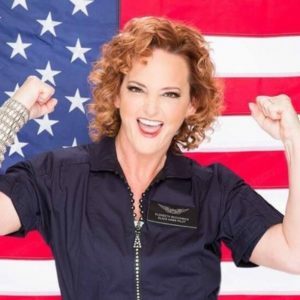 She inspires audiences with her experiences and stories from her years as a Black Hawk Helicopter pilot and turns them into relatable lessons that any audience can put into immediate action. A No. 1 best-selling author with more than 10 books out, Elizabeth recently launched her Soar 2 Success series of business success tip books with more than 15 more books in development for 2014-2015. Elizabeth’s first personal development book, The PILOT Method- the 5 Elemental Truths to Leading Yourself in Life. Elizabeth resides in the Dallas-Fort Worth metroplex and travels throughout Texas, nationally and internationally for conferences, conventions, and events.